Indian Express: A 13-year-old boy drowned in the swimming pool of a boarding school run by the International Society for Krishna Consciousness (ISKCON), police said Tuesday. 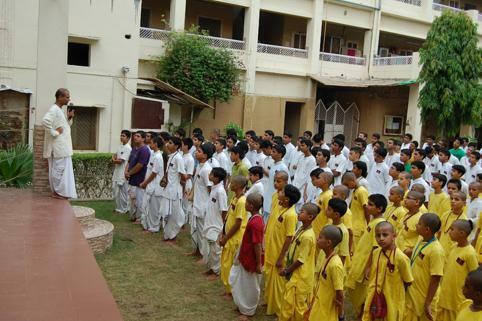 The incident took place yesterday when Kartik, a 7th class student in Delhi, was taking a bath in the pool of the Bhakti Vedanta Gurukul and International School (BGIS), Vrindavan station in charge Uday Pratap Singh said. The victim’s friends alerted the school staff when they spotted him struggling in the waters, he said, adding the boy was rushed to a hospital where he was declared dead on arrival. “Prima facie it is a case of negligence on part of the school management as no trainer was deployed near the pool at the time of the incident. Only, the school vice principal, who is not a trained swimmer, was present at the spot,” Singh said. The body has been sent for postmortem, he said. The police added that no FIR has been registered in the case so far as no one has come forward with a complaint. Meanwhile, ISKCON PRO Ravilochan said the school management has ordered a probe into the incident.